Beacon Digital along with Invatech Health and Cardiff University is delighted to have won the 2016 Health Service Journal Award for ‘Improving Care with Technology’ which was awarded at a ceremony at the InterContinental Hotel in London on the 23rd of November. Now in their 35th Year, the HSJ Awards are amongst the most keenly sought after accolades in British healthcare celebrating and promoting the finest achievements in innovation and practice. 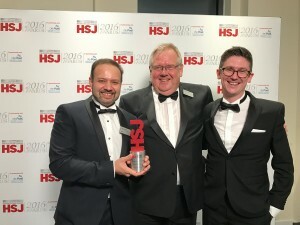 ‘The Beacon Digital team are delighted that the Proactive Care System has won the HSJ award. It is welcome recognition for the innovative and pioneering work the company has achieved in translating a system that enhances safety and efficiency affordably for care homes. We are very proud that the judges have recognised the positive impact of the Proactive Care System in the face of strong competition’. Judges said the system had “transformed” medicines management in care homes and had “real potential” for wider application. Included in photo from L-R are: Tariq Muhammad, CEO Invatech Health, Clive Bowman, Chairman Beacon Digital and Dr. Matt Smith, Programme Director at Cardiff University.